Arisima. One of the seven worlds of Ochen in this epic fantasy book series, is a desert world that is a harsh, hot land of scrub desert and sand dunes. Oases, temperate, green areas located over underground bodies of water, are centers of civilization. There, the vegetation is lush with tall trees, and flowering bushes and vines, a welcome respite to the harsh browns and reds of the deserts. The largest of the oases, Zoraya Oasis, is the stunning capital of Arisima. Built over an immense reservoir, the city offers cool comfortable restaurants, varied plant life from six of the seven worlds, and myriad waterfalls throughout. It is also home to the skipping portals. Arisima is noted for its stunning horses, which are a major export. Recently, the merchants of Sorial have discovered the profits to be gained by building resort complexes at the more conveniently located oases. This has led to an influx of vacationers onto Arisima, increasing the revenue of the local merchants. Though fewer in number, religious travelers come to Arisima to experience life in any one of a number of monasteries where ancient writings are kept and studied. Aleppo Monastery is perhaps the most well-known. 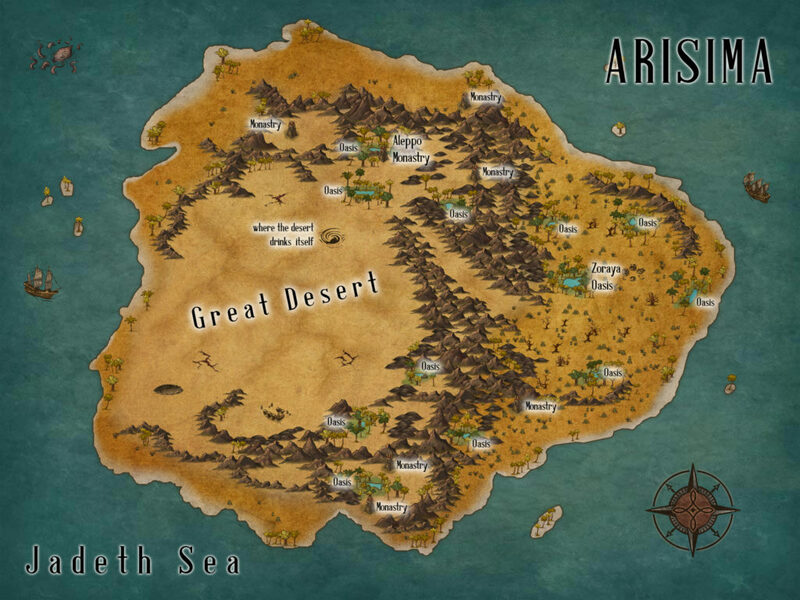 Due to the magic energy that saturates the air of Arisima, pirates are a hazard of desert travel. Magic-empowered airships frequent the skies above the dunes seeking plunder and unwary prey for the lucrative slave markets. Within the last few decades, the royal family of Ochen has sought to end their reign of terror by keeping a strong military presence on Arisima. As a result, the pirates are now few in number, making travel to oases safe—or so the Sorial merchants say.